Unless it has been custom made, the bridal gown you purchased is not designed to fit your exact measurements. As with any garment, especially a wedding gown, a perfect fit requires the experienced and steady hand of an expert seamstress, knowledgeable in the art and science of wedding gown design and custom tailoring. We can make your dress fit you like a glove and, you can have a look to remember! Typically, it takes three fittings to complete bridal gown alterations, but it can be done in two. After all, it’s all about having fun and an amazing experience with friends and loved ones. Make sure you appointment as soon as you know when your dress will arrive! It’s best to schedule your first fitting as soon you have ordered your dress (6~8 weeks before the wedding).This initial fitting runs an hour. Please don’t worry about an undergarment or bra. During our first fitting we will determine if you need one and if you do, We will let you know what style and where you can buy it. 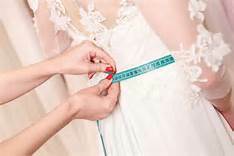 Strive to be at your target size by this appointment so that any major alterations we make will work on the aisle. You will need to bring an undergarment (if you decided you need one on your first fitting). You also can bring various jewelry pieces and other things to try on with your dress. Most of the work on your dress will be done by hand and We will do a minor tune up if needed before we machine it. This session is exclusively for final tweaks and therefore should happen as close to the wedding as possible.